On Nov. 7 at a special event in Detroit, Inforum Michigan released the 2017 Women’s Leadership Report, an in-depth analysis of the status of women at the highest levels of governance and leadership in Michigan’s largest 100 publicly traded companies. The report is a collaborative initiative between Inforum and the Mike Ilitch School of Business at Wayne State University. The report, produced by the Mike Ilitch School of Business at Wayne State University, is being released today at a luncheon at the Detroit Marriott and is available online. "There are some top performers in our study – the companies with the most women board members are General Motors, with five women who comprise 45 percent of the board; and Kellogg, whose five women directors represent 38 percent of its board. Companies with four women directors are Herman Miller, CMS Energy and Steelcase,” said Associate Dean Toni Somers, who co-authored the report with Sheri Perelli, a management professor, and Inforum leaders. 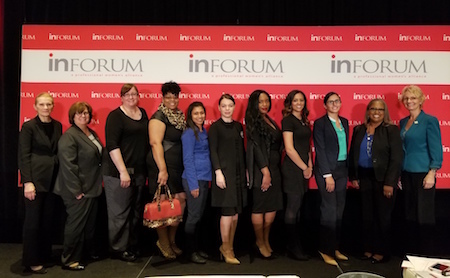 Since 2003, Inforum has tracked those changes documenting the status of women directors, executive officers and top-compensated executives at two-year intervals. The 2017 report updates gender diversity over the last two years, and presents and interprets longer range changes in women’s share of board seats and top leadership roles over a 10-year span. This year’s research shows incremental gains achieved by women as public company directors and officers between 2007 and 2017. However, the gender gap at the highest levels of leadership in our largest companies persists. The report also highlights strategies some companies have used to make their boards and executive suites more diverse and offers insight into how more progress can be made.